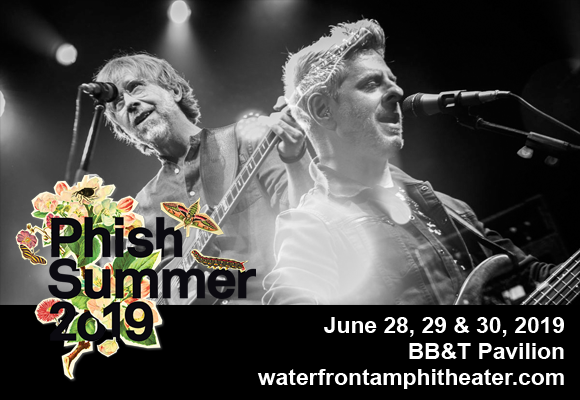 Despite frontman Trey Anastasio hitting the road with new band Ghosts of the Forest this year, the dependable and incredible Phish are set to embark on their annual summer tour in 2019, gathering fans for a three-night Phish-fest at BB&T Pavilion! On Sunday 30th June 2019, the band will close their epic three-night-run with one of their trademark spectacular sets, chock full of incredible music and eye-popping visuals! Phish concerts must be seen to be believed! Tickets available now! Formed in 1983 at the University of Vermont, American rock band Phish are one of the world's most famous jam bands. Following in the footsteps of the Grateful Dead with their sprawling, improv-led live shows, extensive touring schedule and enthusiastic fan base, Phish's current and most well-known line-up of "Trey, Page, Mike, and Fish" (lead vocalist and guitarist Trey Anastasio, bassist Mike Gordon, keyborad player Page McConnell and drummer John Fishman) has performed together on-and-off for over thirty years (the band has taken two brief hiatuses, from October 2000, to December 2002, and from August 2004 to March 2009). Throughout its career, Phish has released thirteen studio albums and in the United States the group has sold over eight million albums and DVDs.